At the beginning of December, I had the pleasure of taking another neural mobilization workshop with Jon Martine. This workshop dealt primarily with neural mobilization around the hips, shoulders, and spine as well as some visceral manipulation. I was once again very surprised and pleased with how effective the work could be with a lot of patience but very little force. Particularly in working with the visceral components it often felt more like listening to the body take on a life of its own rather than making something happen. While I can tell there is still a long way to go with developing my skills around it, it does seem to be a great way to practice listening and following in the way I work. I had some strong experiences in my own body related to the work as well. In particular, after having work around the collar bones and shoulders, I felt width in my shoulders on a level that I don’t think I have experienced before. It made me strongly aware of how often I hold postures that compress my shoulders or attempt to take up less space with my body than it actually occupies. While I’m fairly aware of having broad shoulders, it was the first time I can recall feeling them truly relax into their full width. I also got lucky enough to be the demo body for the work on liver, lungs, stomach, and transversus thoracis. Because I have a mild-moderate pectus excavatum, the area of the middle and upper chest has always felt like a particularly problematic area for me to open up. Jon had me test with side bending before and after the work and the difference was pretty amazing. Before, I felt my ribs could side bend pretty readily, but something in the middle was hanging me up; but after freeing up the internal structures, it was like I could bend another 20 degrees further to each side! I’ve since had an opportunity to play with this style of work with a few clients and I’m really happy with the results. I really like the effect it is having on my ability to listen better in fascial work too. This past Thursday to Sunday I had my hands full… of nerves. Inside Out Body Therapies of Durham hosted a workshop by Jon Martine on Neural Mobilization strategies. The nerve fibers running through your body are not only surrounded by fascia, but also internally wrapped together by fascia as well. 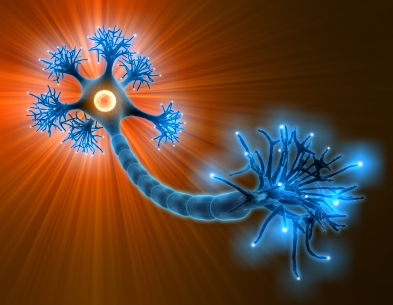 Each nerve fiber is wrapped and then bundles of fibers are wrapped together eventually forming the full nerve. Ideally, these layers of wrapping work together to allow the nerves to glide and stretch through the body the same way your muscles must stretch as you move. This motion is beautifully illustrated in the video Strolling Under The Skin (Note that this video contains images of living tissue). If the wrapping around the nerves becomes impinged or stuck, the nerves will signal muscles to contract in order to prevent the nerves from stretching too far or being damaged. 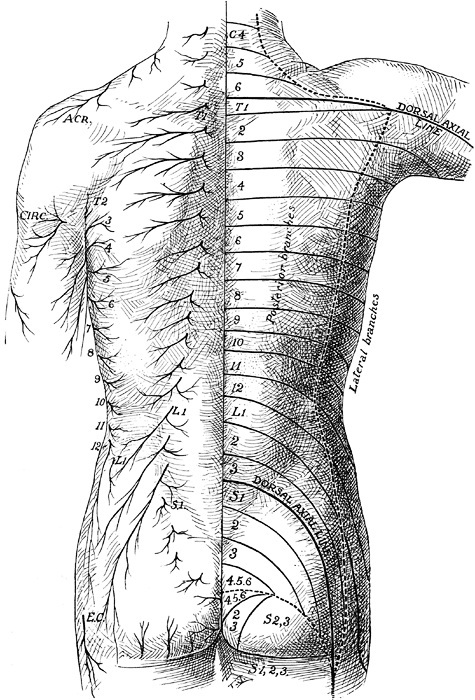 So sometimes what we may read as a tight muscle is actually a tight nerve using the muscle to protect itself. By releasing the nerve and allowing it to glide, the muscles may be allowed to release their tone and move more freely. Going into the workshop, I was not sure what to expect from this style of work but came out really thrilled with some of the results. The workshop focused on arms and legs (Jon plans to be back in December for an axial nerves class) and I felt some incredible unwindings both in mine and other particpants bodies. For me one of the strongest effects was felt in my forearms. Having been in computer programming for 8 years, my forearms have taken on the inward roll of a keyboardist. So when my arms would hand at my side, my thumbs would end up pointing at my legs rather than foreward. This has contributed to other issues like rolled shoulders, a hunched posture, etc. But with very little pressure, one of my classmates was able to unwind that twist by almost 90 degrees just by opening up the nerves in my arm. I have since tried this with a few clients who had had limited response with fascial work and have been very pleased with the results. For several clients who’s bodies were inflamed or wound up, neural mobilization seems to have been very helpful in allowing their bodies to relax, recharge, and hurt less. It is really incredible to watch how someone’s body and entire system can settle with this work. I’m very excited about adding this dimension to my work and grateful to Jon and IOBT for putting together this workshop.